Maya Norula did her schooling from Sophia Girls' School, Meerut and BA from Lady Shri Ram College. After that she started working at British School, New Delhi as Head, A levels / IBDP Coordinator and worked there for 15 years. 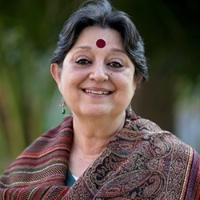 In 2008, she joined Pathways World School Secondary as the Principal. In 2010, she started working at Hopetown Girls' School and since then she is working there as the Principal. The principal of a school is like the centre of a wheel. The principal keeps everything in line and in good working order. The principal is in charge of keeping the school working so that teachers, students, and support staff can function and complete their respective jobs. A principal needs to be a strong leader to staff, a fair hiring agent for new teachers and aides, an advocate to students, and a disciplinarian when necessary. A principal also serves as an intermediate between the county board of education and the school system in which they are employed. "After completing my education, I started working at Woodstock School, Mussoorie. After that I have worked in many other schools like Welham Boys' School, Dehradun, British School, New Delhi and Pathways World School, Gurgaon. In 2010, I joined Hopetown Girls'School, Dehradun as the Principal."